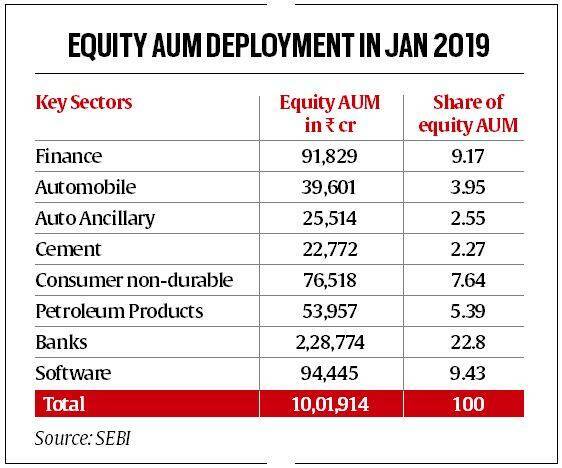 While overall equity assets under management (AUM) of mutual funds deployed across various sectors fell marginally by 1.6 per cent to Rs 10.01 lakh crore in January over that in December 2018, the industry saw continued churn in fund movement from one sector to another that has been visible since the IL&FS crisis in September 2018. According to Securities and Exchange Board of India (Sebi) data, while sectors such as banking, software and petroleum products witnessed a noticeable jump in their share of industry equity AUM, firms across finance, automobile, auto ancillary and cement witnessed a decline in not only absolute AUM but also a dip in their share of industry AUM. Over the last one month the banks’ share of industry equity AUM rose by almost one percentage point to 22.83 per cent with an AUM of Rs 228,774 crore. The share of software too rose by 98 basis points to 9.43 per cent with an AUM of Rs 94.445 crore. By comparison, the share of equity funds in finance firms dipped by 46 basis points to 9.17 per cent with an AUM of 91,829 crore. Similarly, the auto sector has also seen a decline in fresh inflow of MF funds with their share fall from 4.37 per cent in December 2018 to 3.95 per cent in January 2019. Market participants say that the change in share of equity allocation is both on account of shift in allocations from unflavoured to favoured sectors, it is also on account of relative movement in share prices of firms across various sectors. It is important to note that finance companies, especially NBFCs, saw a sharp decline in their share prices following the IL&FS crisis and even automobile and auto ancillary companies have been under pressure over the last few months following weak sales growth in the festive season. The shift in fund allocation has been following a trend since September 2018 when the IL&FS crisis hit the market. Over the last five months banks have witnessed a significant rise in their AUM from 2.1 lakh crore in August 2018 to 2.28 lakh crore in Jan 2019 thereby taking its share of overall industry equity AUM from 20.21 per cent to 22.83 per cent. Similarly, the share of software has risen from 8.43 per cent to 9.43 per cent and that of petroleum products have jumped from 4.34 per cent in August to 5.39 per cent in January. On the other hand, finance companies that include NBFCs, which came under pressure following the IL&FS crisis, saw their absolute AUM fall from 1.05 lakh crore in August 2018 to 91,829 crore in January witnessing a decline in the AUM share from 10.13 per cent to 9.17 per cent. In the same period, share of auto sector, that had a weak festive season and was also hurt by the NBFC crisis, has declined from 5.16 per cent to 3.95 per cent.